Ryan Wallace works on multiple themes at the same time, using different types of paint. 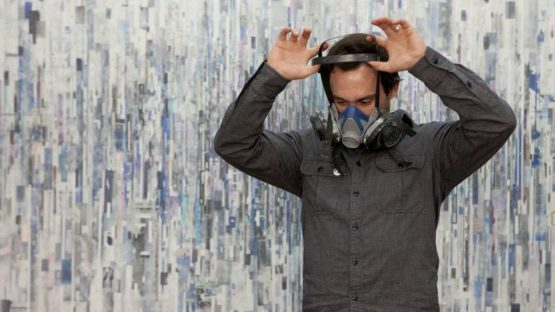 He draws on paper, paints on wooden panels, canvases and sometimes mixes them all together. He can wondrously multitask, and sometimes even works on few pieces at the same time. Wallace uses tape, shredded paper, wax and other rejected studio material to create his abstractions. The artist intentionally leaves the reference of his work hidden, allowing the viewer to experience the painting in his own style. What Wallace makes are not just simple paintings, they are more the multidimensional creations that require time and space to be comprehended in fullness. Ryan Wallace was born in New York in 1977, and he went to Rhode Island School of Design, where he graduated in 1999 with Bachelor of Fine Arts. Ever since he started pursuing art he could not separate the metaphysical from the concrete subjects that concern him. In his mix media works, he sticks to putting his formations in landscape mode, but beyond them, hides the horizon of hidden references to intangible concepts. He exhibited his pieces all around USA and Europe. 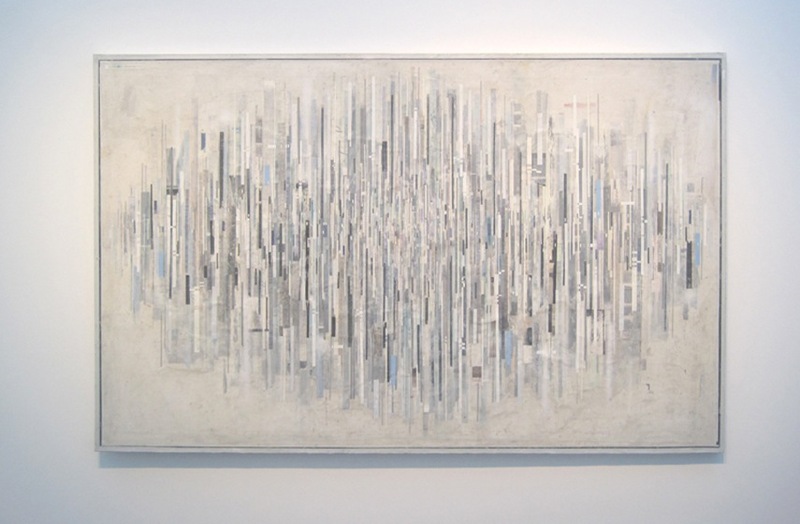 In 2011, he received the Pollock-Krasner Foundation Grant. Since he works under the theme of ideas and notions, he avoids linear space and categorical shapes. His work is introspective and requires some contemplation. He believes that there was a greater world before we shaped it into its present look. The form just traps the essence, and that is the reason he breaks the formations into separate abstractions. The undefined landscapes still carry the remains of the definitions, so that is where the introspection steps in. We all have, in our consciousness, the answers to questions, we just need the external stimulus to move us. That is the purpose of his art. Wallace uses cold tones colors and geometrical abstractions. What moves him is how humanity evolves and how out lives are changing constantly. Evolution in technology changed everything we knew about work, health, psychology. Yet, some mysteries still stayed hidden. The origin of life and the truth that transcends the human experience are just a few of the topics that interest him. When he tries to express them, he chooses the unnatural forms and cold colors, to symbolize the nonhuman nature of those ideas. The one dimension that still belongs to this world is space and when he paints, he tries to use the most of it. Light is also very important, and Wallace stays very careful in how he uses it to emphasize the appeal of his mysterious pieces. Familiar motifs, such as geometrical shapes, have the role of guiding the viewer through his work. After they get into the painting they are left to themselves. The dialog between the artist and the viewer, through the abstract painting, is the crucial element of his art. Context is very important for right comprehension of the artist’s intentions. Sometimes, it is not about the meaning, it is about an experience. 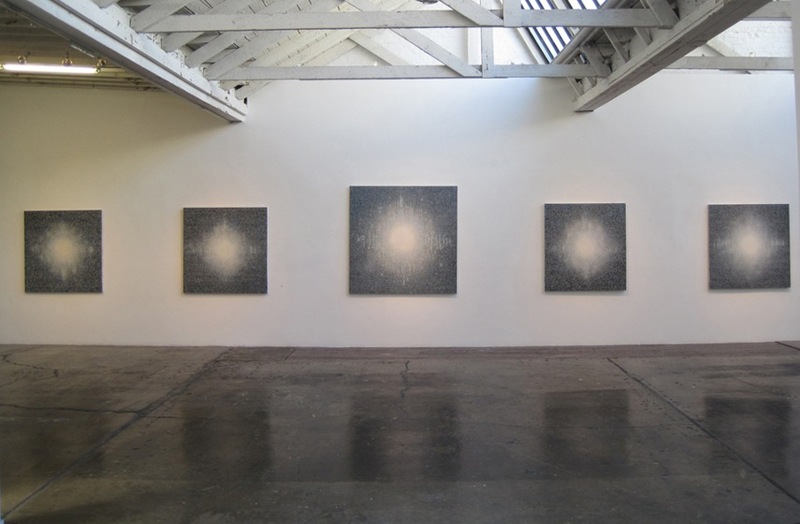 When he had a duo exhibition in 2011 with artist Hilary Pecis, he showed his Omega Point in contrast of the Pecis’ work. The contradiction sometimes gives the best definition, and without seeing what is not, we couldn’t see what it really is. These dichotomies stand as an agency of logic and the artist uses them well. A typical property of his paintings are hidden references, that cannot be seen at first glance. Sometimes they are only visible thanks to the gallery light. It is a note to an importance of set and setting, and they are the attributes of the concept of space. Where we see something is as important as the subject of our perception. In Omega Point series the viewer has to search for the meaning. Tangled brush movements lead to the center of the paintings where light and highlights stress out the core of the image. 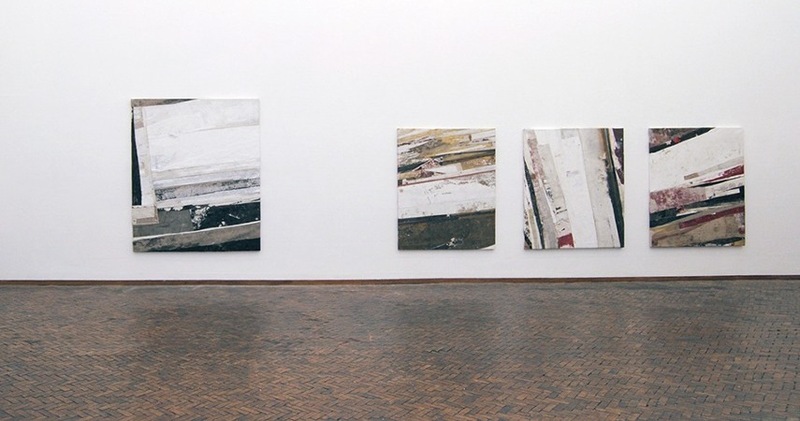 The paintings are successively positioned near each other in the gallery, so they can echo through the room. Ryan Wallace often uses recycled material. He constructs and reconstructs his works imitating the natural cycle of birth and dying. What vanished in a material sense, did not die in the world of ideas, and can still be reborn and recreated. Playing in a personal ecosystem, the artist performs his own reincarnations. Every time he rebuilds his pieces he gives them a new dimension. Along with his changes, there is also the connection to the time flow. As the time goes by, the occurrences around us change, and his mission is to mark its passing in the artistic form. 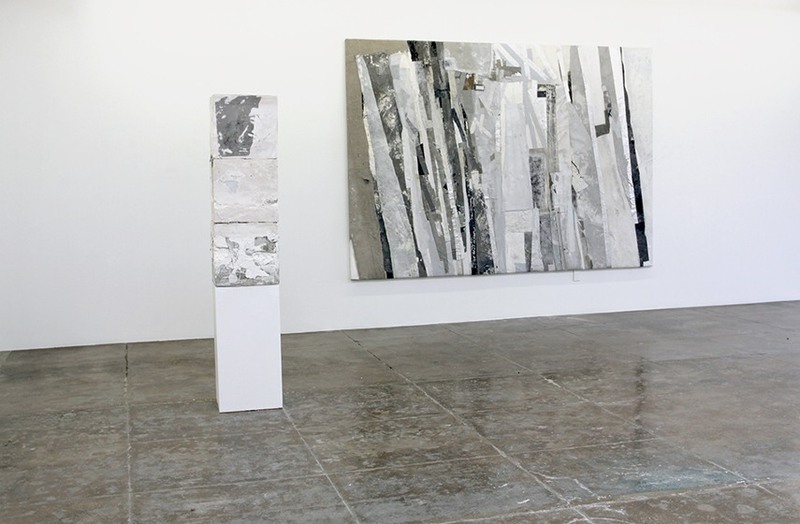 He does that in the form of painting, installations and sculpture. He uses acrylics, tape, plastic, in addition to concrete and plaster that he places in molds and carefully transfers onto panels. All these mediums are united under one idea, of showing the unseen in the landscape of hidden material shapes. Ryan Wallace lives and works in New York.